1. 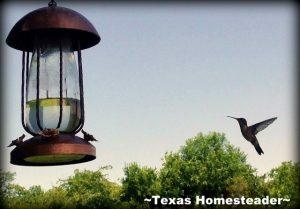 The hummingbirds are back! Now back in ‘the day’ that meant I’d run to the discount store & buy packets of dried red powder to fill the feeder. But oh how that’s not needed! Now I whip up my own homemade Hummingbird Food in minutes and for literally pennies. 2. …And I don’t want to forget our other feathered friends. We have lots of birds that visit our back yard. They bring lots of enjoyment to RancherMan & me. But that doesn’t mean I plunk down too much money on that plastic bag of bird seed, oh no! Not since I discovered that chicken scratch (for us sold in compostable paper bags, not plastic) costs only a fraction the price! And the birds love it too. We have a wide variety of birds that visit our bird feeders. 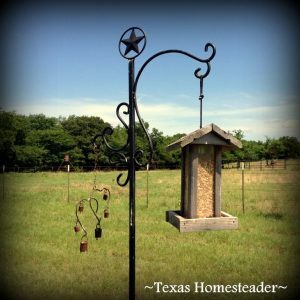 Now it doesn’t cost near as much for us to keep that feeder filled! 3. 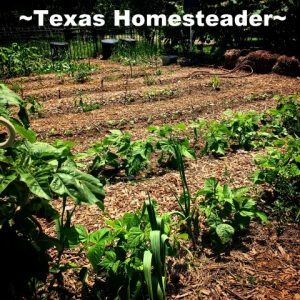 I’m working on a permaculture garden around a tree in my backyard. I’m hoping to add visual interest, improve the soil & the health of the tree and provide an island of pollinator plants too. I started with a thick layer of cardboard on the ground. The cardboard was destined for a landfill so I asked for it. I laid down the cardboard in a thick layer and covered it with Free Mulch I got from our county. I’m trying to heed the advice and plant slowly. So the only things I’ve planted so far are some early-spring flowering bulbs closest to the tree trunk and a small section of elephant garlic. The underground bulbs will help amend the soil and the flower stalk of the garlic will attract pollinators. I’ll also be planting a variety of herbs and flowers in the future. I’ll be sure to share when it’s done! But installing that one side was done during the drought & difficult to complete. This week we finally completed the other side. Much easier! And after the border was installed I used heavy paper feed sacks to thickly cover the ground. 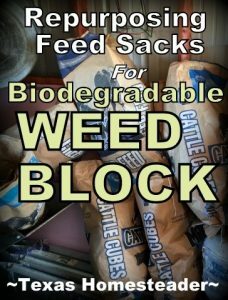 These feed sacks are free material for me to use to help keep anything from growing in this area. Then I simply top the sacks with decorative gravel and voila! Just lovely and less back-breaking weeding chores. 5. As we typically do each year, RancherMan & I took 9 huge 225-lb-sized lidded tubs and filled them with FREE wood mulch from our county. 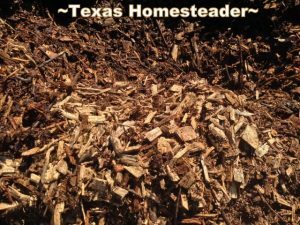 Paper feed sacks are laid down in our garden walkways and topped with this wood mulch. No weed maintenance for walkways for the entire season and it looks great too. For FREE! Oh, and in other garden news… When my zucchini seed didn’t sprout I knew I’d need to replace that spot in the garden. A zucchini plant at the store was $1.99. That’s not expensive, but a pack of seeds was only $1.49 and it contains enough seed for me to have zucchini plants for about 5-6 years! (I store my seed in the refrigerator to make them last longer) There are lots of ways to save in the garden. 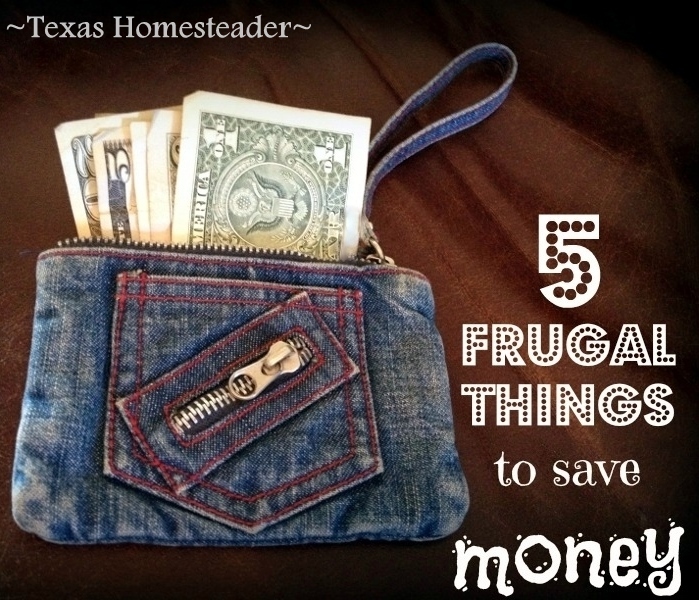 Of course these 5 frugal things don’t really include the things I typically do daily that saves some cash. Things such as cooking homemade & healthy meals from scratch, making a 1/2 gallon of homemade yogurt or making do with what we have to fill our needs. And there are bonus points for those things since each of these cost-saving measures save money again & again. Next time I fill the humming bird or wild-bird feeder? Money saved again. Next time I use Biodegradable weed block? Money saved again. Next time I make my homemade yogurt? Yep, you guessed it! Hopefully this short list gets your creative juices flowing. We can learn from each other too! What are some easy frugal things you’ve worked into your days to easily save some cold, hard cash? Bonus points if it’s a repeated savings. Yes, I too, make my own hummingbird food. And a plus is that I hear that the pre-made food really isn’t good for them. We will be getting a garden put in, in May. Kaleigh and I are both excited about that. When our children were young, I decided that a hair cut for 3 boys and my husband was getting pretty costly so I purchase electric hair clippers for about $20.00. I learned through trial and error how to cut their hair and really it wasn’t that hard to do a basic cut. I have no idea how much money I saved over the years but I know it helped our budget then and I still cut my husbands hair since the boys are grown and on their own. 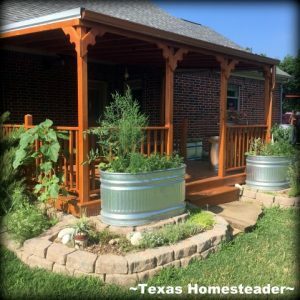 Since I was a stay-at-home mom, and couldn’t help with the income, I looked for ways to save money like hanging clothes on the line instead of using the dryer, raising food in the garden, canning all that I could raise and process, etc. Just turning the lights off when you leave a room saves money. We have made our own hummingbird food for years. Money aside I couldn’t believe that it was healthy to give the little darlings something as nasty as red dye. And speaking of birds, the screech owls are calling and looking at the birdman’s owl nest box. I love to stand outside in the dark and hear them call – they don’t screech but have a sweet call that sounds like buh buh buh buh. Soon we will be setting out a couple of lawn chairs where we can sit at twilight and watch as the parent owls fly a zillion miles an hour (one would think that they would slam into the wall when they do this) into the opening with food for the setting mama and later for the begging babies. Nothing beats living in the boondocks!! !